Last week I was on the east coast, visiting a few places I'd never been before. Rockport. Kennebunkport. Eating lobster every day, rising with the sun to watch the fishermen going out to sea. Next up was Gloucester, home of the men who died during the perfect storm. Actually labelled that by the National Weather Service. But it was also called the Halloween Storm because it arrived at the end of October. 65 knot winds, 39 foot waves. I have to stand in awe of the commercial fishermen who deal with one of Mother Nature's most volatile landscapes - the ocean. At Gloucester harbor, I took these pictures - the Fisherman's Memorial and the names of those lost on the Andrea Gail. And the bar where they hung out. Never seen that movie, but Holland has lots of fishing towns as well, and of course some don't make it back. I love one of the songs about it, though it is very sad. I love Gloucester; we stayed there several times for our summer vacation. Did you find the Dogtown Bookshop? Best Used Bookstore, Ever (Except for The Strand in NYCity). And the Portuguese restaurant near the Harbor. Can you tell I really love Gloucester? Ah you've been to our old stomping grounds. In Kennebunkport right next to the bridge is a fried clam stand in front of a large fish market. Best fried clams in the world, and also good fried onion rings. Ymmmm! We used to live just inland from there and spent a lot of time in the bookstore above the candle shop in the square. Gloucester is picturesque. I love the statue of the old fisherman. Had the fried clams from that exact same clam stand, Barbara, and visited the Dogtown, Debra. Next time I'm going to spend more time in Gloucester. I didn't know how wonderful it was until the visit on my last day. I own that DVD and watch it ever now and then. There is something that really draws me into it. I would like to visit Glocester someday and also make a stop at the Crow's Nest, see the memorial, etc. 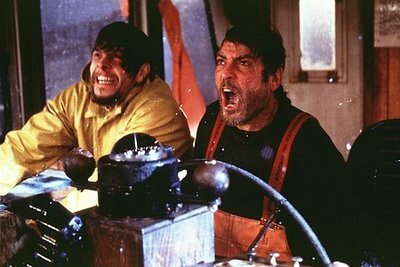 Until this movie, and (afterwards when I read the book) I never really had thought about how dangerous it is for the fishermen out there. Me either, Linda. It never crossed my mind. Since I grew up Back East, only 3 hours from the Atlantic, an hour from the Chesapeake Bay, I love being near the ocean. Big Water. And the power of the Sea impressed me early on. As a child I remember how strong those ocean currents were even close to shore. They could literally drag you under, they were so strong. Strong, beautiful, and often deadly is the Ocean. And mesmerizing. Ohhhh, and that movie scared me to death. Those huge waves rising up, up, up. . .